While we were drinking coffee on the terrace in front of the Delphi museum I saw the first tourist entering from a staircase underneath. He looked like an actor stepping on stage. 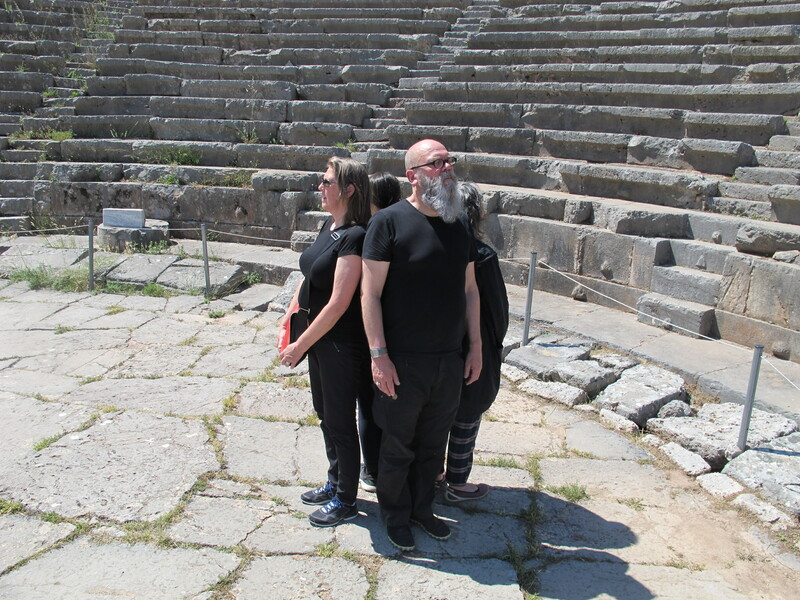 Immediately I had an association with ancient theatre plays. 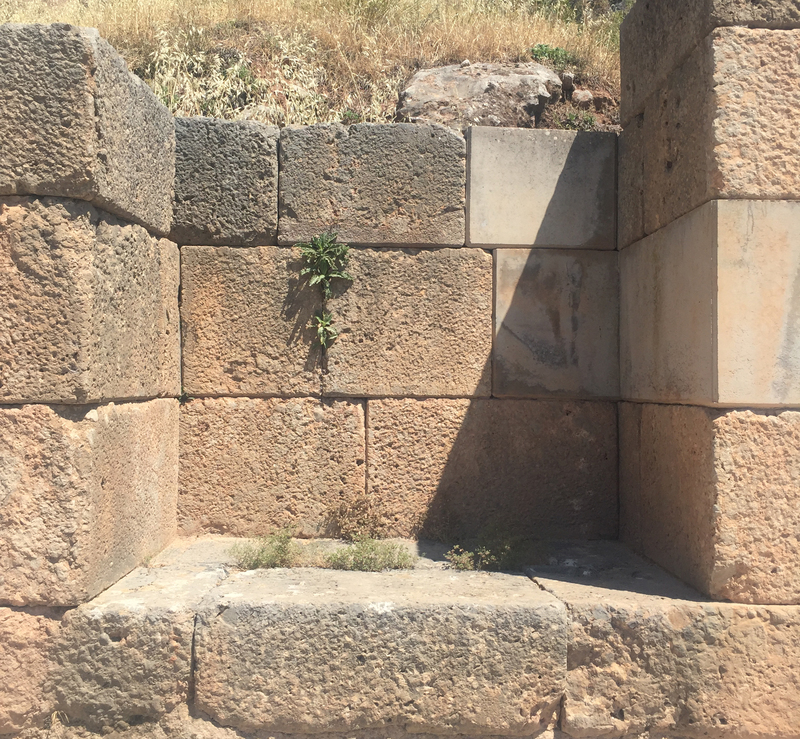 Instead of priests and philosophers occupying the space in ancient times, we have tourists who are animating the spot nowadays . Then Frans van Lent, initiator/organiser of the Parallel Show, explained the project, and we started for the entrance of the sanctuary. 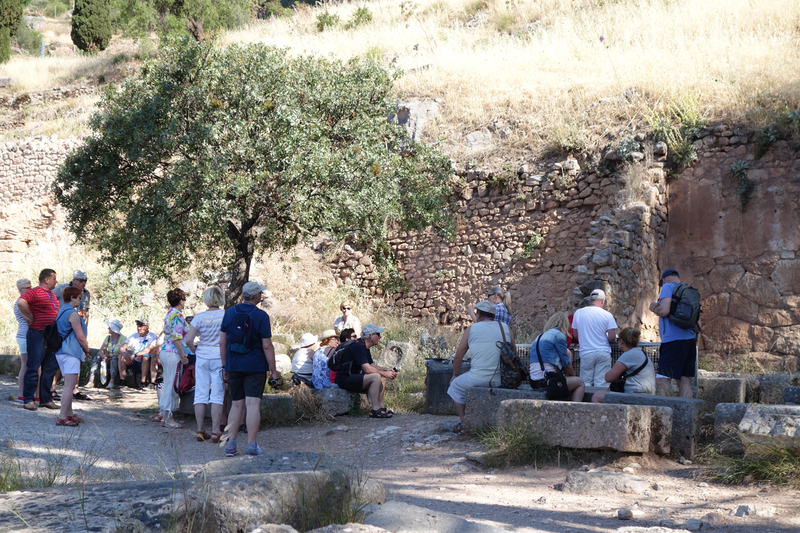 After the first curve in the path towards the remaining ruins I noticed a group of tourists meeting around a tree. The tree was in de shade and so were the tourists. Continuing for the Apollo temple I realised that all tourist-groups were stepping out of the burning sun and in the shade when a guide was explaining. 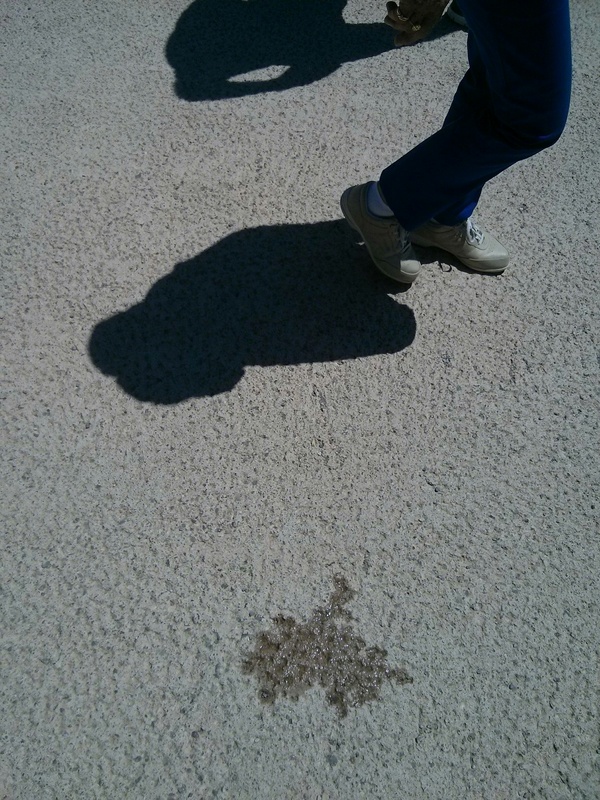 I realised that stepping into the shade also means that you are stepping into a more comfortable space. Standing in the shade people feel more comfortable, at the same time they are taking distance from the site they are visiting. They are reflecting on the things they have been seeing on stage, in the sun. As a visitor of the sanctuary you are constantly changing your perspective. From ancient times to modern times and vice versa. But also from being part of a group and a visitor to your own individuality and personal need, the shade. After a lunch in the village we discussed our experiences and each suggested the group a performing work. I wanted to do something with the site, the tourist and we as a group of artists. 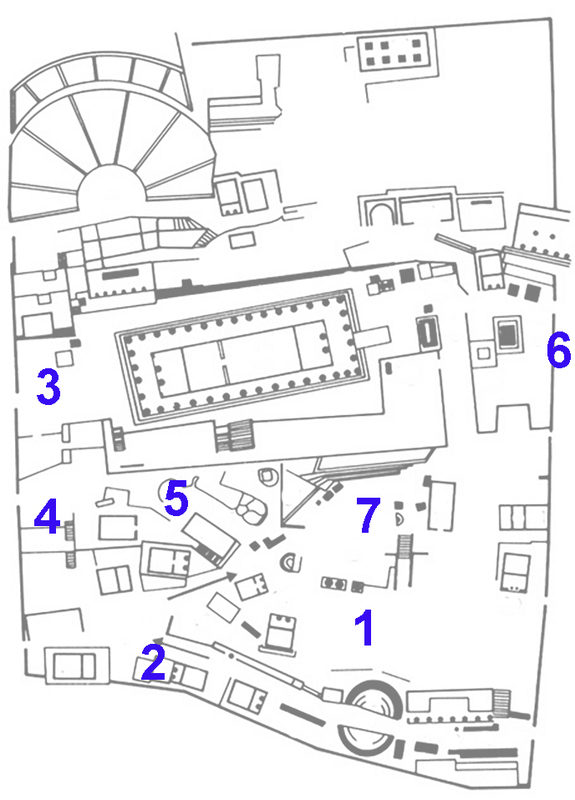 I liked the idea of making a walk to the Apollo temple with the five of us and stopping under four or five trees we would pass by. 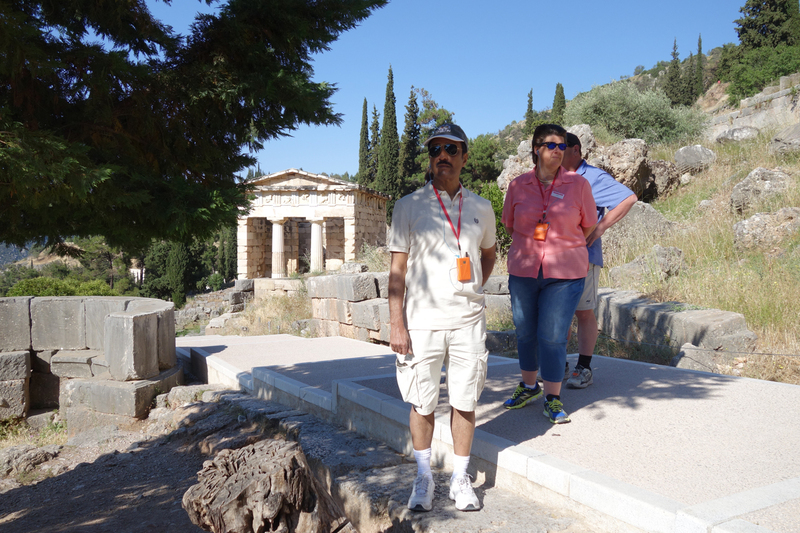 We had to stand next to each other in the shade, facing the antiquities. 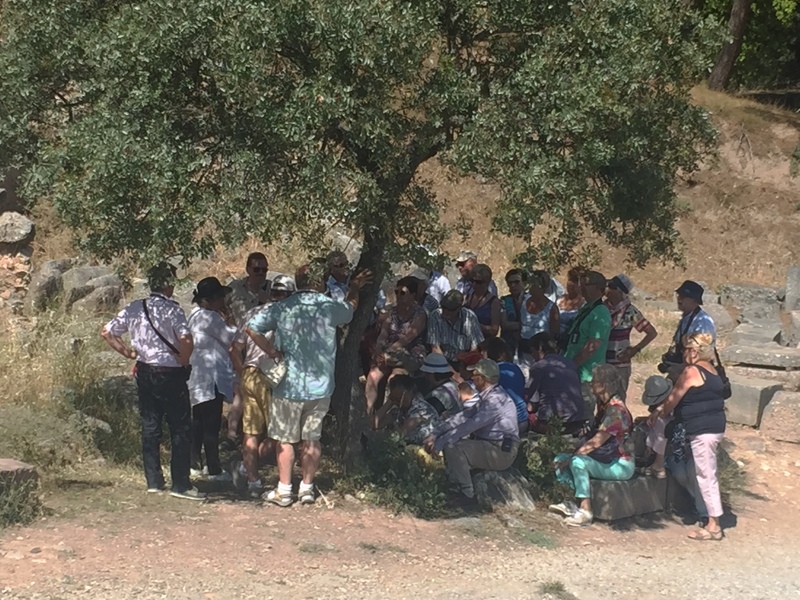 When tourists meet under a tree they are not standing in a tight position but they are spread all over the place. The first spot where we were standing was located directly opposite the entrance. So we were looking at the tourists entering the site. On the second spot we stood quite a while and tourists started to notice that we were standing in a strange position. 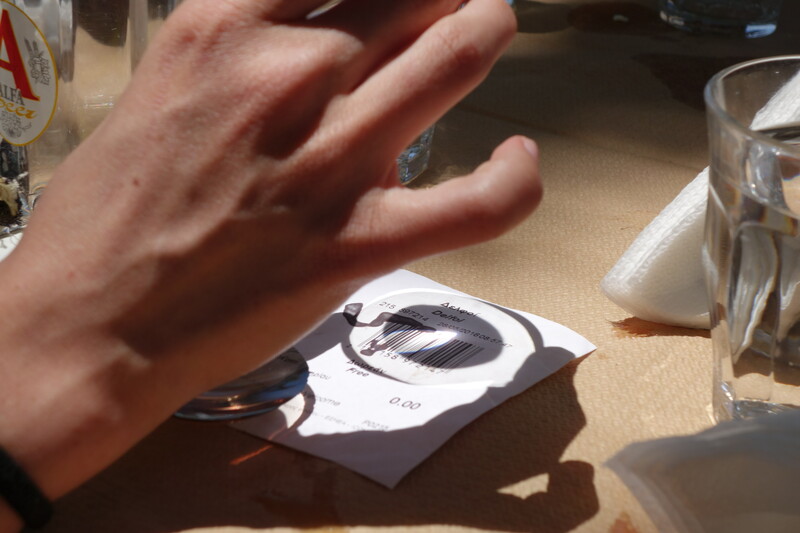 At that moment I realised that I was not only the creator of the concept but also the director of the implementation. I had to give the signal to stop the performance. After the third standing I noticed that doing such a thing makes you part of the surroundings but it also makes you reflect on a higher level. You reflect and act on the place and on the meaning of it but it also gives you ideas about the way people nowadays appropriate a holy spot to give their own life sense. I visited the Sanctuary of Apollo before. 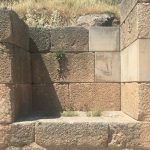 Today, compared to my last visit twenty years ago, the site is in its organisation far more adapted to the growing number of visiting tourists. More fencing, more concrete, more signs. And also more supervision. Until early afternoon the site was very crowded, many groups were moving around. It was difficult to cut oneself off from this, so I used it as a point of departure. The work started at the entrance of the site. I waited for the first organised group to pass me. I joined this group in their way up, became part of it. When the group stopped for an explanation from the guide, I stopped too. When I noticed somebody of this group making a photo I went to that same spot and took the same shot. When another group passed the first group, I stepped over and joined that group to it’s next stop. Again, as soon as I noticed somebody making a photo I made a photo from the same spot. This process continued till I reached the highest part of the site, the Stadium. The work started smoothly but slowed down on the way up. The groups became smaller (and younger) because the climbing was tiring. The last group up to the Stadium consisted of just three Italians climbing together. The organised groups already stopped at a lower level. When I reached the Stadium the work ended. Later, when it was less crowded, I was able to focus more on the physical aspects of the site itself. I made a series of photo’s of parts of the terrain without a presentation structure, parts where stones are nothing more than remains, leftovers. The site is, next to a historic spiritual center, also a storage of architectural objects that lost their initial purpose. 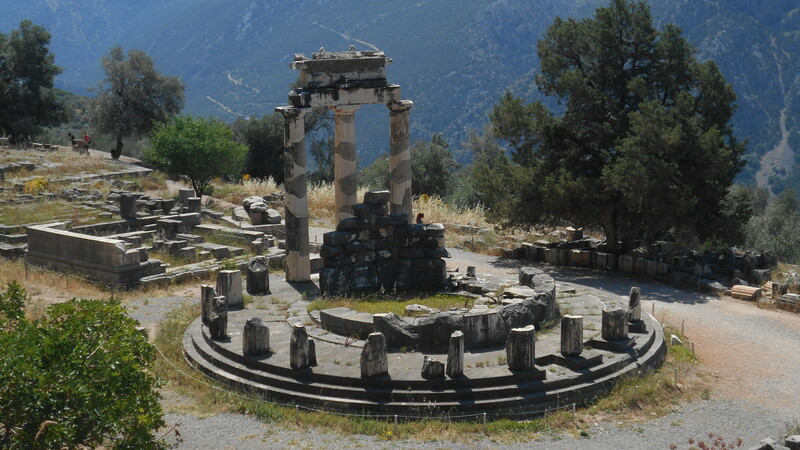 What was once given to Apollo was never to leave his Sanctuary again. 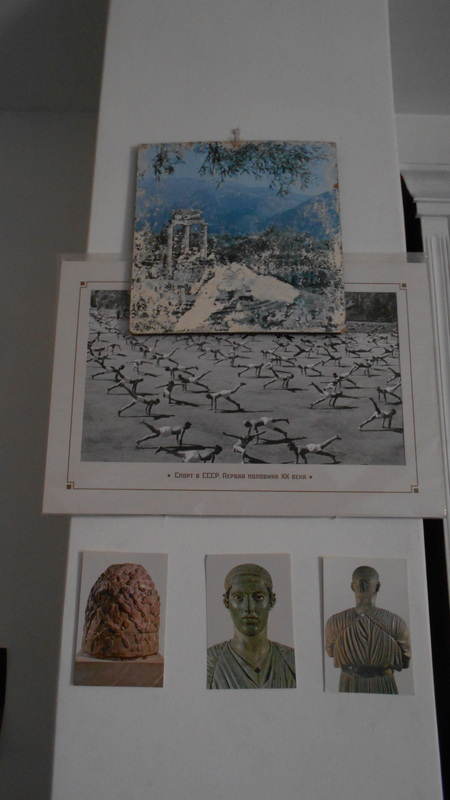 For 5 years an image of the Tholos temple has been on my wall. 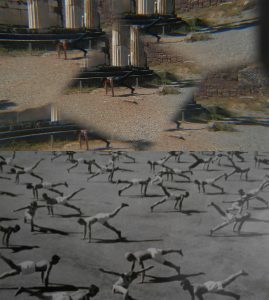 I have marked a visual extension to it, by adding a picture of CCCP athletes exercising. 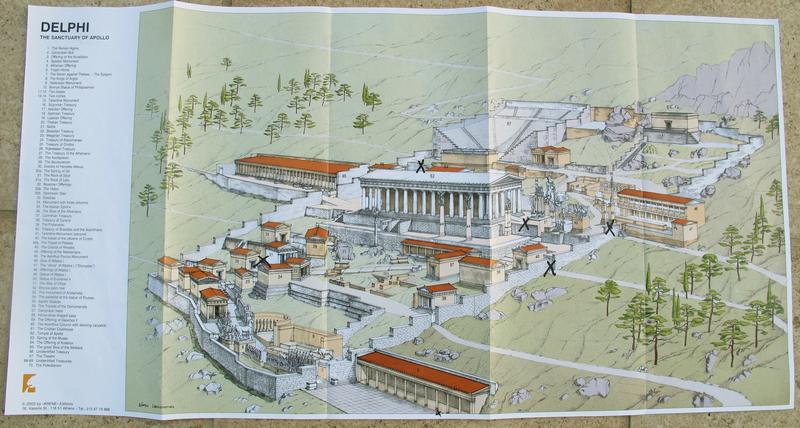 When invited to participate in TheParallelShow, this image turned into a plan to be realized, along with encountering the sacred Omphalos stone and the Iniohos (Charioteer) up close. On the site I had brought some props, that could be used if an opportunity occurred. 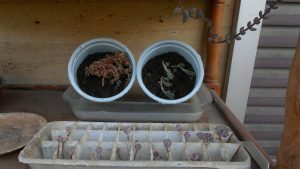 I did 3 actions using props and an intervention of gardening. 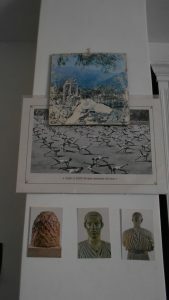 Then, I followed the pre-existing plan, transforming the images on my wall into experienced events. I. 3 actions using props in the name of Apollo, noted as instructions. 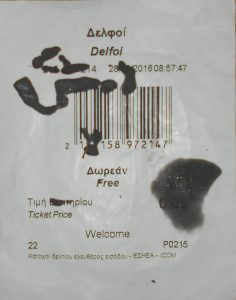 Concentrate the Delphic light through a magnifying lens on the temperature-sensitive ticket of entrance to the Apollo’s temple, until shapes begin to appear. Stop immediately when the excitement of success is overcome, and you realize that you could be in control of the light and the shapes. 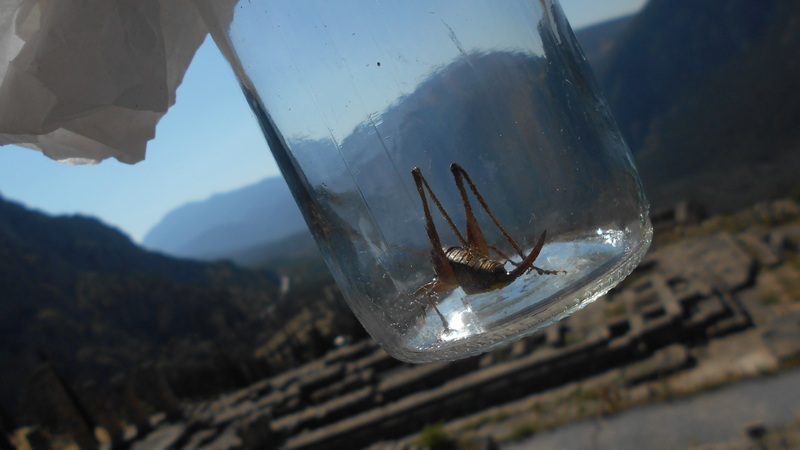 Using a glass jar, capture a grasshopper (locust) in the archaelogical site. Focus on its structure, compare it with other structures attributed to Apollo, release. 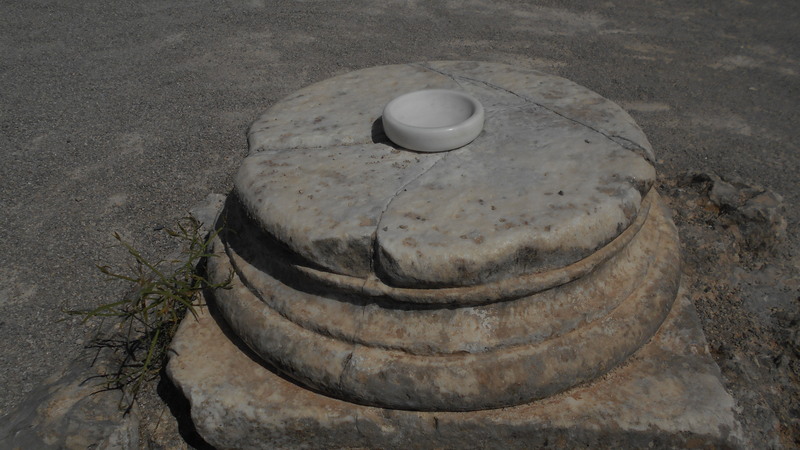 Find a perfect fit for a contemporary marble object in one of the marble ruins. Does the contact between contemporary marble and ancient marble evoke thoughts of the sublime? Marble is in either case a material with eternal lifespan. Take a digital (immaterial) picture underlining the triviality of your own lifespan. One of TheParallelShow’s basic instructions was that the performance should not leave any traces behind. 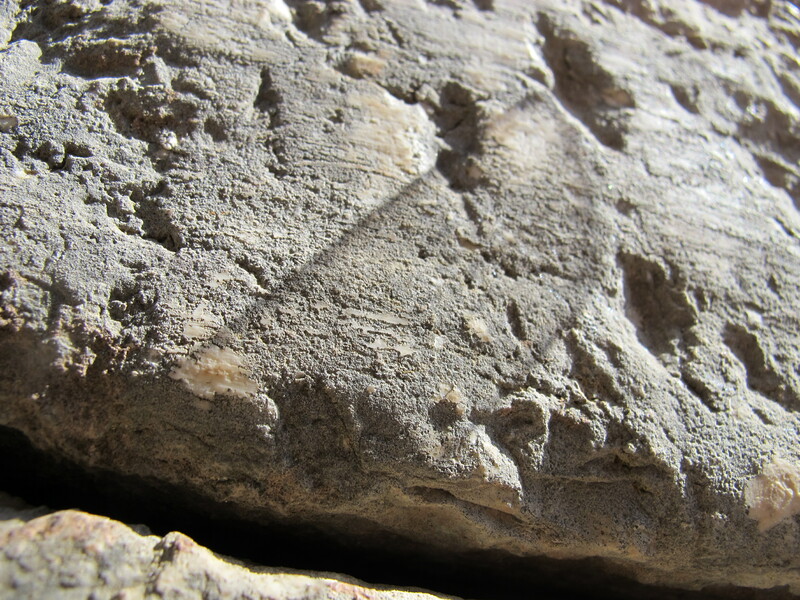 At archaeological sites it is usually forbidden to remove anything from the site as a souvenir. Because succulent plants have the ability to be successfully replanted even without their roots, I removed 2 different kinds of succulent plants from the Apollo’s temple site and replanted them at the Athena Pronaia site, keeping a piece of each kind for my personal succulent collection. 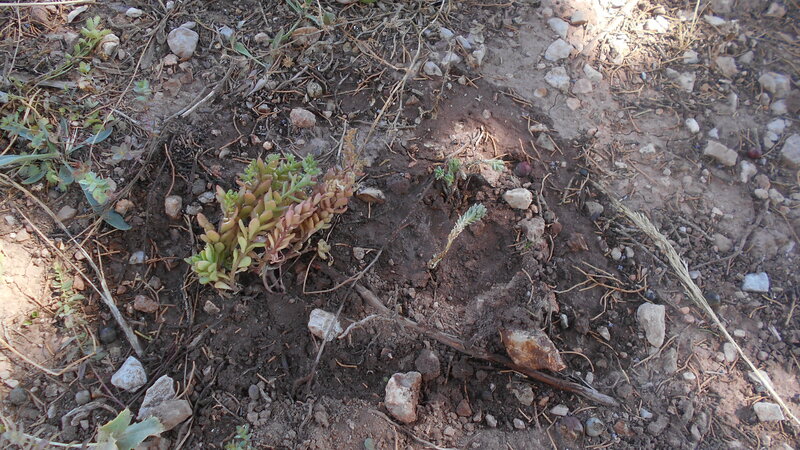 Replanted at the Athena Pronaia site and replanted at my succulent garden. Exercise 1: planking with one leg lifted (tripod plank). 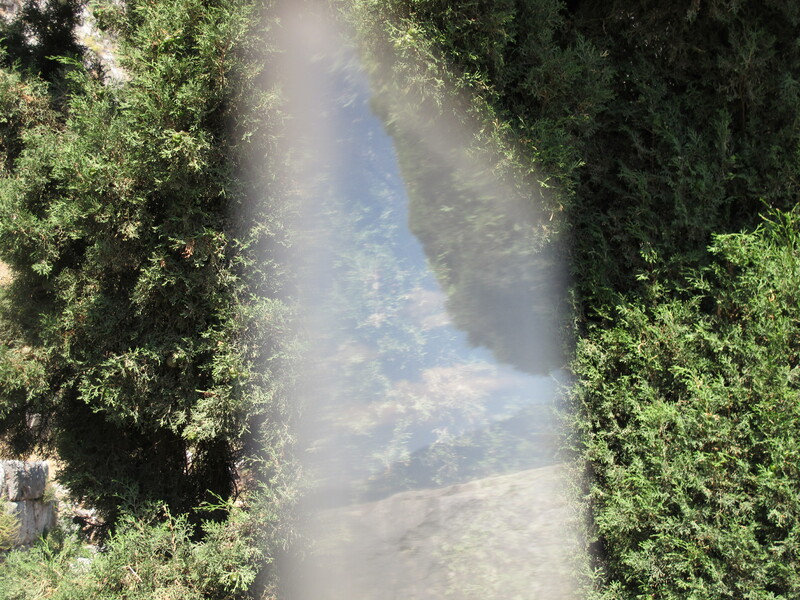 Picture is taken by Jello, using a faceted lens to simulate the multiplicity of the athletes, as in the original image. Visiting the museum after performing this exercise, the same posture was found on the mermaid figures that served as decorative handles for the Oracles tripod. 3. 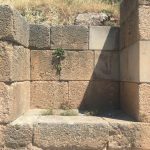 Encountering the sacred Omphalus stone, which marked the center of the world. At this point, I was already tired. 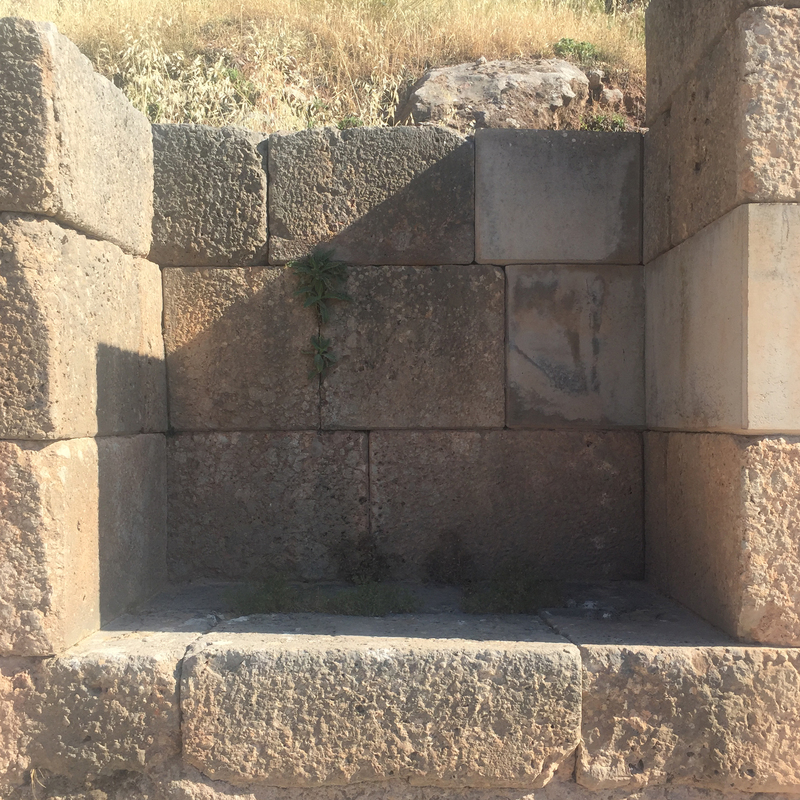 When in the Omphalos stone room, I forgot to bend ove the repositioned center of the world. A fly flew around the Charioteer room, and sat on his foot leading my focus there. These feet of exquisite craftsmanship, were not to be seen in the original sculpture composition, as they would be hidden behind the chariot. 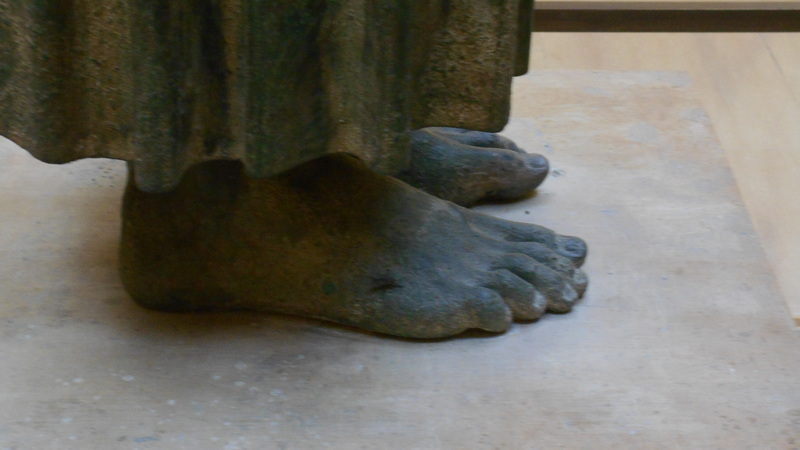 The fly gave me the terrible impression that the Charioteer had smelly feet. The brief illusion of bodily odor, once again confirmed the Charioteer’s vibrant mystique. Ending the day, I ate the “Iniohos burger” (μπιφτέκι Ηνίοχος) at the “INIOHOS Hotel Restaurant”. 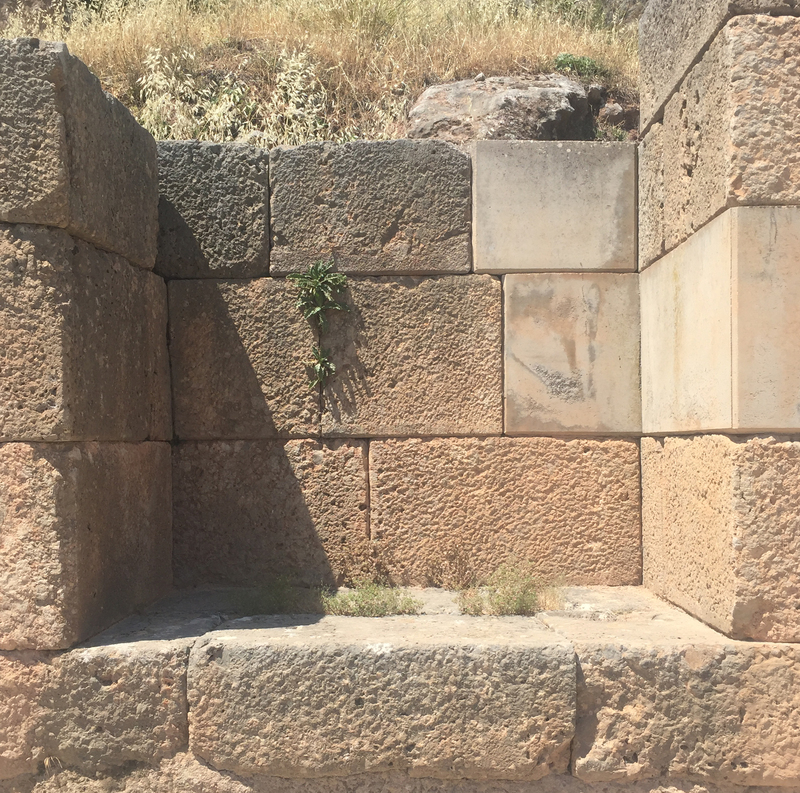 In Delphi, I found myself lost in both the now-moment and in history. Exploring the site, I decided to wander around while making notes of both my state of mind and of my findings. I also took photographs at random. ‘I am walking, I look around without concentration. My focus constantly switches on and off. Turmoil in my head. I climb the stairs slower and slower, stop, take my camera and make pictures of plants and flowers. I hear tourist-guides around me. They chatter in Greek, American, Chinese, Italian. I pick up lost pieces of paper ( a Wi-Fi number, a lottery paper, a ticket origami, folded). I took a picture of one of these. I listen to bird sounds while I’m walking. For some time I follow my shadow, until the stairs lead me in another direction. Cameras are clicking everywhere around me. 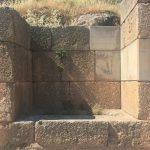 Now I am at the spot where Zeus threw down a stone to mark the centre of the world. I feel rushed, groups of tourists are passing. I cannot concentrate. I continue and wait, standing in the shade of a tree. Looking around: stones everywhere, remnants of columns. Excited shouts of tourists who discover signs, braille texts. It starts to get warm now: 30 ° Celsius and it is only 9:45 in the morning. The slope is in full sunlight. Why can’t I remember this place the way I experience it now? I was here before, somewhere in The 70’s. I want to know and not know at the same time. I decide to stop writing and to take pictures, I want to be in the present. I am aware that I am walking here to prepare a performative work that I will carry out this afternoon. I would like to postpone this moment of developing an idea. I start writing again because I am afraid to lose the experiences, the details. I am a lousy researcher. I can’t concentrate. I switch my focus to easily. I am climbing on. From the theater I look down at the temple of Apollo in the valley. I think about teaching materials for my pupils (age 7-9). A tourist shouts ‘stop!’ to her group, pointing that she wants to make a group photo. My pencil drops a heavy shadow on the paper. I could make a drawing now but I decide not to. I have to find my focus. I continue my climb up to the Stadium. Alexia just comes down with a story about the behaviour of an eccentric female-guard. While descending the mountain I sometimes stop to pour a bit of water on the ground and watch it transforming in different shapes and disappearing by evaporation. I make several pictures. While focussing on the action and effects, I felt tourist passing without giving any attention. Or were they just polite and let me go on, thinking their own thoughts? For this performance I asked the other participants (Frans, Jello, Maarten and Alexa) to join. We started like any group of tourists, walking disorderly following the instructions of the guide. At a signal we gathered and formed a circle with our backs pointed inwards. After a while I called the name of something I noticed at that moment. The others did the same in other languages. We left the circle again, started walking disorderly, and the gathering repeated in different places for 3 times. After Maartens ‘Line-up in the shade’-performance I felt less at ease. I felt more observed. The sound of saying words loudly makes the act more noticeable. I start choosing more eye catching places to form a circle, like the theatre. The side effects were unexpected: a group of tourists (from Shanghai) asked us to join them for a group selfie while singing out loud together. I do not know whether our performance triggered a sense of community . I guess it is a coincidence. For my 4th performative work I used the concept Map of Storage of Frans van Lent. I took a series of photographs with a filter I borrowed from Alexia Karavela. She brought several different camera-filters. I chose the one with a grid on it. 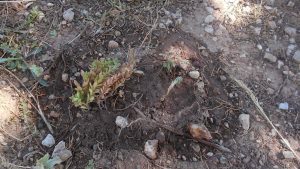 I started to look for a non-object while other visitors of the archaeological site were moving in prescribed directions. As soon as I found an unnoticeable spot, I took several pictures, holding the filter between the non-object and the camera-lens. The results were unpredictable. The filter with the grid directed my choice for taking or not taking a picture. 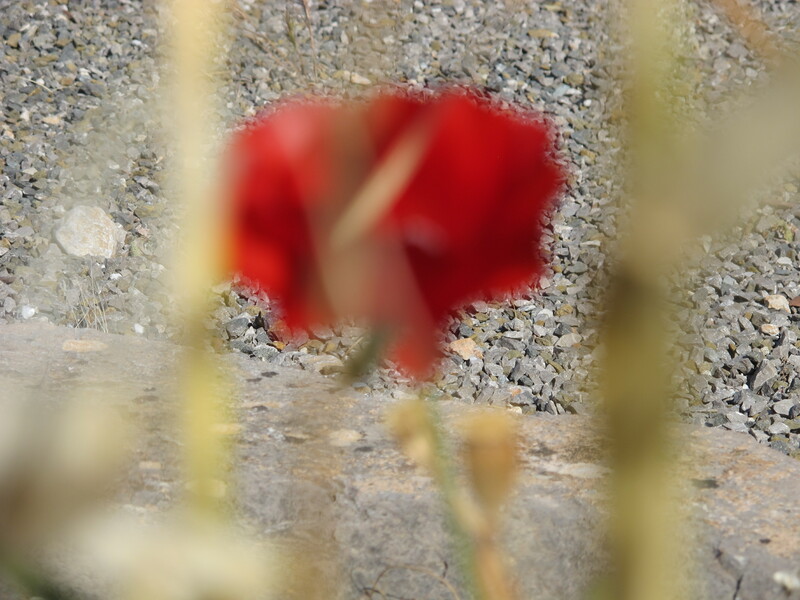 Sometimes sharp, sometimes blurry, sometimes with the background in focus. On a map I marked the places where I took the photos. We all met the day before at the busstation in Athens. 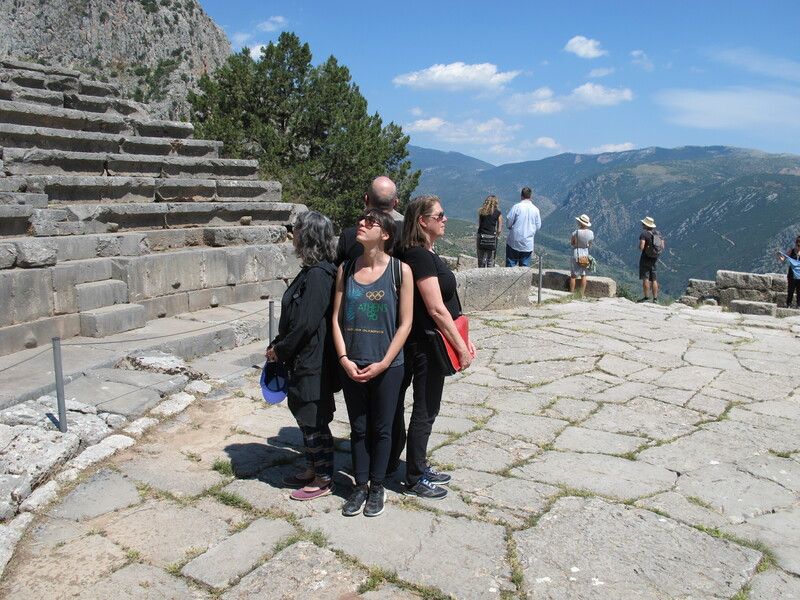 Together we travelled to Delphi. 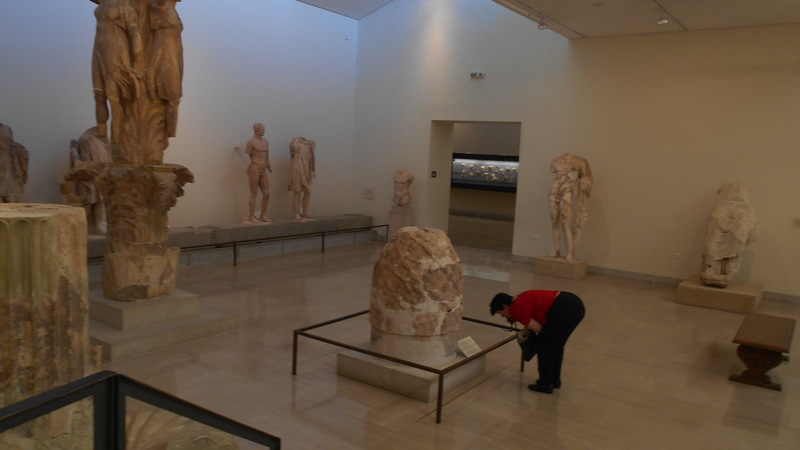 On arrival we agreed to meet next morning at opening time at the Archeological museum. On Saturday May 28 at 08.00 we came together at the entrance of the museum. 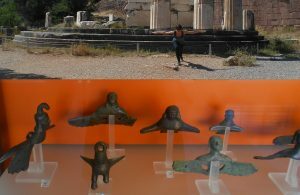 We bought tickets for the museum and the archeological site, we had a coffee and I explained to the others the character and the background of TheParallelShow. We discussed the experimental nature of the project and the possibility to change any rule (except the rule of leaving no traces). 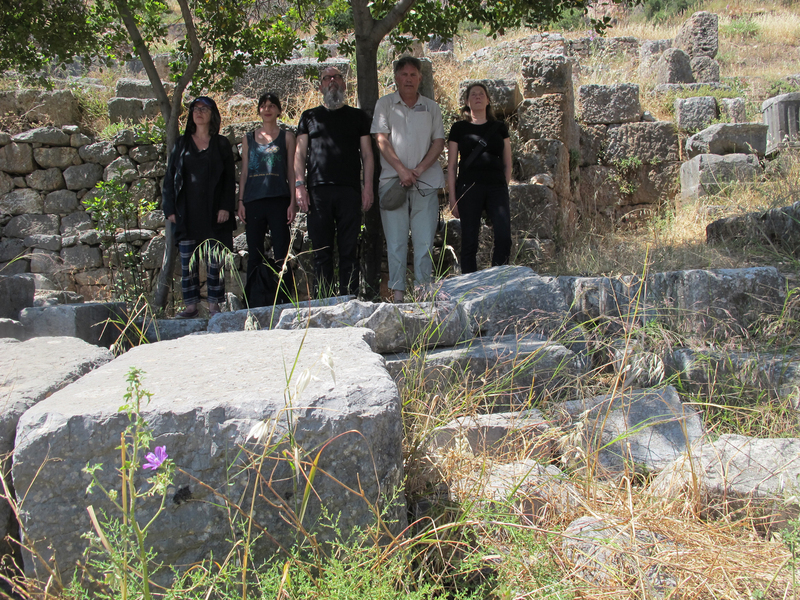 We then all individually left for the Sanctuary to explore the site and to find possibilities and opportunities. At the start we were tourists as well as participants in the project, and susceptible to the history and beauty of the site. It takes some time to get accustomed in order to distance oneself somewhat from that first impression. At 12.00 we met again at the entrance and, as a group, returned to the town to have lunch and to discuss the possibilities. After lunch, back at the site, we started to carry out two cooperative works (concepts of Ellen and Maarten) and then the team split up to perform all individual works. Finally we met again at the entrance of the museum at 18.00.